What is FATCA? The Foreign Account Tax Compliance Act - commonly referred to as FATCA - requires foreign financial institutions (FFIs) to report to the IRS information about financial accounts and income held by U.S. citizens on foreign accounts with more than $50,000. It also increases the due diligence and reporting by U.S. banks and financial institutions. 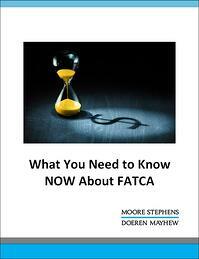 With the majority of FATCA filings containing some sort of error, you need to be informed to be in FATCA compliance! Download our ebook today by completing the form.